In the event that you have purchased with us in the past you will probably already know that we're extremely affordable when it comes to supplying you with Xerox 4510VN toner. Every single order for this Xerox Phaser 4510-VN toner cartridge is backed with our renowned low price promise, to give you every chance of saving money. We pride ourselves on supplying high quality toner for the Xerox Phaser 4510-VN printer which are manufactured to very exact standards. Cartridge Save offer you a, rock solid money back guarantee on your Xerox Phaser 4510VN toner cartridge so that you'll never have to put up with a poorly performing cartridge. Saving money is effortless when you shop with us because we supply you with free next day delivery on Xerox Phaser 4510-VN toner cartridges. Ordering Xerox toner cartridges at Cartridge Save couldn't be cheap. Our industry leading customer support teams will be happy to assist you all the way. Place your order. 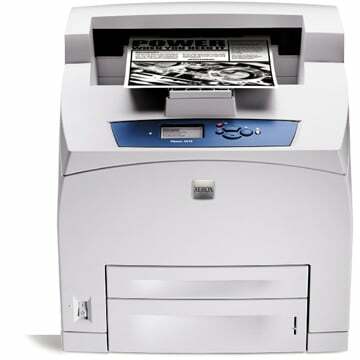 The Xerox Phaser 4510VN black and white printer is one of the network-friendly options in the Phaser 4510 line. The Phaser 4510VN monochrome laser printer boasts the same print speeds like its siblings and it is aimed at small offices like its predecessor, but it retains some of the previous unit's flaws and lack of some important features, which could help improve productivity in a workgroup. Measuring 422mm wide, 404mm tall, and 465mm deep, and weighing 20.5Kg, the Xerox Phaser 4510VN network printer can easily fit into a standard desktop without occupying too much space. Xerox integrated 128MB of memory with a 533MHz processor into the device, which can be connected to a computer via USB 2.0 or a parallel connection, or to a network via Ethernet. The default paper capacity is up to 700 sheets, and the monthly duty cycle is up to 25,000 pages. There is a small display screen in the control panel with minimal buttons. It can print in speeds of up to 43ppm, with the first page out in eight seconds. Text documents and simple graphics are printed sharply because of the 1200x1200dpi resolution. It is possible to increase the RAM of the Xerox Phaser 4510VN workgroup laser printer to 512MB. Users can print on different types of media from labels to heavyweight, recycled, and coated paper, as well as transparencies. The Phaser 4510VN supports a good selection of common printer languages. This model is able to use a high capacity black Xerox Phaser 4510VN cartridge to print more efficiently. The Xerox Phaser 4510VN mono laser printer does not have built-in Wi-Fi, and two-sided printing is optional. There are no options to expand the paper capacity beyond 700 sheets. To enjoy features like proof prints, saved prints, and personal print, users need to buy a 40GB hard disk drive for the Xerox 4510VN printer. Borderless printing, mirror image, image smoothing, and booklet printing are also optional.